The cuplex kryos NEXT marks a new milestone in CPU water block development. Every detail has been analyzed, optimized and tested to achieve perfection in cooling performance, installation procedure and product features. 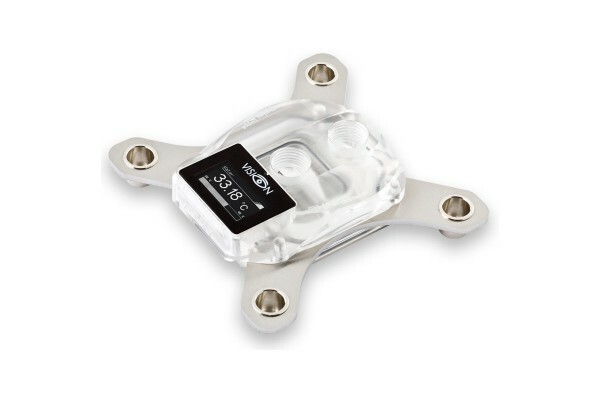 The result is not just a CPU water block with outstanding performance - it is a product series with various models differing in color and functionality. The VARIO models are the first CPU water blocks globally to incorporate a real-time adjustable base - never before has it been possible to adjust the geometry of a CPU block to perfectly fit the CPU while the PC is in operation. Models with VISION module are equipped with modern electronics: High resolution OLED display, integrated water temperature sensor and USB interface are just three of the features. The base part of the cuplex kryos NEXT is equipped with an extremely fine micro structure, the structural width is lower than 200 µm. The coolant is injected centrally through a slot-shaped nozzle and then runs to both sides of the structure. The base itself is manufactured from copper, nickel plated copper or .925 sterling silver depending on model. The cuplex kryos NEXT retention system consists of 2.5 mm thick stainless steel plates equipped with nickel plated spring cups. Springs and knurled screws secure the water block on the motherboard, the retention system has a very clean look when installed. All retention system versions feature a mechanical stop for optimum clamping force and even force distribution. The knurled screws can be installed by hand, additionally a hexagon socket wrench can be used for easy installation. Water blocks for socket 115x or AM3 include a steel back plate with silicone insulation to stabilize the CPU region of the motherboard. Socket 2011/2066 motherboards already include a back plate as part of the CPU socket, therefore no additional back plate is required. For optimum performance, every cuplex kryos NEXT ships with outstanding thermal compound. A syringe with 0.5 grams of Thermal Grizzly Kryonaut is included, complete with plastic spatula. This compound has a high thermal conductivity and spreads out thin and evenly between CPU and water block due to its low viscosity. The amount is sufficient for approximately five applications. The acrylic glass variants of the cuplex kryos NEXT with VISION are additionally equipped with a RGB LED that can be controlled depending on temperature or via USB. With this product you receive a license for the current and next year version of the software. Please note that an Internet connection is required for the installation and activation of the software. Further information about the licensing and activation of the aquasuite software can be found here.